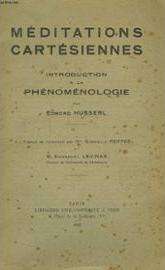 Cartesian Meditations: An Introduction to Phenomenology (French: Méditations cartésiennes: Introduction à la phénoménologie) is a book by the philosopher Edmund Husserl, based on four lectures he gave at the Sorbonne, in the Amphithéatre Descartes on February 23 and 25, 1929. Over the next two years, he and his assistant Eugen Fink expanded and elaborated on the text of these lectures. These expanded lectures were first published in a 1931 French translation by Gabrielle Peiffer and Emmanuel Levinas with advice from Alexandre Koyré. They were published in German, along with the original Pariser Vortrage, in 1950, and again in an English translation by Dorion Cairns in 1960, based on a typescript of the text (Typescript C) which Husserl had designated for Cairns in 1933. The Cartesian Meditations were never published in German during Husserl's lifetime, a fact which has led some commentators to conclude that Husserl had become dissatisfied with the work in relation to its aim, namely an introduction to transcendental phenomenology. The text introduces the main features of Husserl's mature transcendental phenomenology, including (not exhaustively) the transcendental reduction, the epoché, static and genetic phenomenology, eidetic reduction, and eidetic phenomenology. In the Fourth Meditation, Husserl argues that transcendental phenomenology is nothing other than transcendental idealism. France's greatest thinker, René Descartes, gave transcendental phenomenology new Impulses through his Meditations; their study acted quite directly on the transformation of an already developing phenomenology into a new kind of transcendental philosophy. Accordingly one might almost call transcendental phenomenology a neo-Cartesianism, even though It Is obliged — and precisely by its radical development of Cartesian motifs — to reject nearly all the well-known doctrinal content of the Cartesian philosophy. Meditations Cartesiennes: Introduction à la phenomenologie. 1931. Gabrielle Peiffer and Emmanuel Levinas, trans. Paris: Armand Collin. Meditations Cartesiennes: Introduction à la phenomenologie. 1947. Gabrielle Peiffer and Emmanuel Levinas, trans. Paris: Vrin. Cartesian Meditations. 1960. Dorion Cairns, trans. The Hague: Martinus Nijhoff. Dermot Moran, Rodney K. B. Parker (eds.). 2016. Studia Phaenomenologica: Vol. XV / 2015. Early Phenomenology. Zeta Books. p. 150.